National Geographic Global Networks CEO Courteney Monroe and Gordon Ramsay announced today during the network’s session at the Television Critics Press Tour the greenlight of “Gordon Ramsay: Uncharted,” a series that draws connections between exploration, adventure and food – with a dash of friendly competition – starring Ramsay. Produced by his own Studio Ramsay, the celebrated chef will embark on anthropology-through-cuisine expeditions to unearth the most incredible people, places and flavors the world has to offer. “Gordon Ramsay: Uncharted” will premiere globally in 2019 on National Geographic in 171 countries and 43 languages, with Studio Ramsay/All3 Media retaining rights in the remaining international territories. Production is set to begin this fall. Food and adventure programming is familiar ground for Ramsay, whose 2010 U.K. series for Channel 4, “Gordon’s Great Escapes,” saw the venerable chef explore the food culture of India and Southeast Asia. An Ironman athlete and adrenaline junkie, Ramsay has long held the belief that learning is best achieved by doing – a philosophy for not only how he cooks but also how he runs his business. For his global restaurant chain Ramsay sends his Michelin-starred chefs around the world to hone new skills and flavors from the most unlikely people and places. Each episode of “Uncharted” will include three key ingredients: unlocking a culture’s culinary secrets through exploration and adventure with local food heroes, no matter where they may lead him; tracking down high-octane traditions, pastimes and customs that are specific to the region in hopes of discovering the undiscovered; and, finally, testing Ramsay against the locals, pitting his own interpretations of regional dishes against the tried-and-true classics. The series moves beyond conversation to truly immerse Ramsay in all aspects of the local culture to better prepare him for the final friendly cooking competition with local chefs and foodies. The next-generation multimedia production company Studio Ramsay was founded in 2016 by Ramsay and has a joint venture with All3Media to develop and produce both unscripted and scripted television shows, creating new formats and innovative programming that include a scripted arm focused on food-related themes and development of new talent on a global front. The catalog of programs that Ramsay has worked on historically with All3Media via One Potato Two Potato, together with new original content he’s currently developing, make for a unique and dynamic production and distribution partnership. 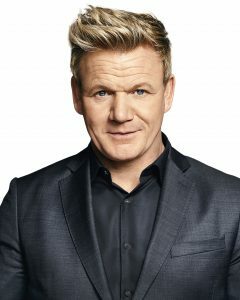 Studio Ramsay’s first production, live “The F Word With Gordon Ramsay,” premiered last summer in the U.S. on FOX, and its second FOX series, “Gordon Ramsay’s 24 Hours to Hell and Back” currently airs of FOX. Its first daytime cooking series, “Culinary Genius,” premiered on ITV in the U.K. and was syndicated on FOX stations in the U.S. last summer. His documentary series, “Gordon on Cocaine,” premiered in the fall on ITV to critical acclaim. “Matilda and the Ramsay Bunch,” starring Tilly Ramsay for U.K. children’s channel CBBC, is also produced by Studio Ramsay. For more information, please visit www.gordonramsay.com or follow Gordon Ramsay on Facebook, Twitter and Instagram.